We can only live fully by embracing both birth and death, which are our two greatest teachers. Facing our fears and preparing for the difficult times of life are the secret to finding joy and meaning in this existence. Let’s Change the End of Life Together! If you are interested in working in the end-of-life arena, curious about death and dying, hoping to lessen your fear of death, or longing to live life fully and fearlessly ... you've come to the right place! I'm here to be your guide, supporter, and motivator as you take steps to change your own mindset about death and dying and change our society as well. 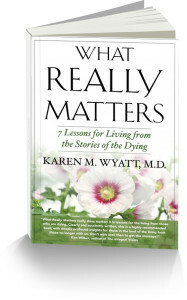 I'll share with you what I've learned over the years as a hospice physician and what I'm discovering on my own journey through later life. Together we'll explore what's possible, face our fears, and figure out how to make the most of this fragile life here on planet Earth. Come and join the movement! Interested in Teaching a Death and Dying Class?